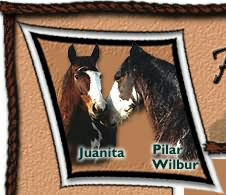 One of the Rancher strains of the Spanish Barb is the Wilbur-Cruce horse. 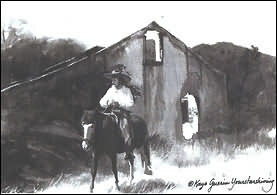 Eva Antonia Wilbur-Cruce, author of the book "A Beautiful Cruel Country" was a third generation rancher in southern Arizona, close to the Mexican border. The ranch has a beautiful Cottonwood forest among which the old ranch house is nestled, rugged mountains, canyons, long distances between water, predators such as mountain lions, and the harsh climate including many hot days and dry summers. 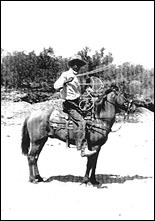 The ranch was homesteaded in 1885 by Dr. Reuben Wilbur. He purchased a manada (a small breeding herd) from Juan Sepulveda, a horse trader from Sonora, Mexico, who brought large herds of horses from Mission Dolores all the way up to Kansas. Mission Dolores was Father Kino's 16th &17th century central breeding operation for the original Spanish horse and other livestock. This little horse carried missionaries such as famous Father Kino, as well as native people and settlers for thousands of miles through the rugged "wild west" with comparatively little feed, little water, and little care. The 25 horses that started Dr. Wilbur's herd in 1885 are highly praised and well described as the "little rock horse" by his granddaughter Eva Antonia Wilbur-Cruce, who in 1930 took over ranch management after her father passed away. Eva fought hard to keep her herd pure, for she valued and treasured their quickness, surefootedness, hard feet, intelligence, and courage. The horses ran free on the ranch, fending for themselves. The rugged environment influenced the selection process. Only horses used for work were rounded up and trained. This herd lived in isolation on the Wilbur-Cruce Ranch for over 100 years, until 1989, when Eva sold most of the ranch to Nature Conservancy due to her old age. Thank you to the Zimmerman family for the historic photographs.